A great video to celebrate Thanksgiving. See an enactment of the first North American Thanksgiving at Plymouth. Watch children put on hip waders and go chest high into the bog during the fall cranberry harvest. 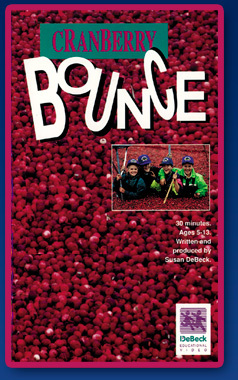 Cranberry Bounce introduces children to the seasons on a cranberry farm. Along the way, they learn about the biology of cranberry reproduction, geography of cranberry growing areas, some cranberry recipes, and cranberry decorations. The Cranberry Bounce instruction guide helps teachers plan excellent hands on science activities. Students can count the number of seeds in a cranberry and make a class graph of the results or write on everything they know about cranberries. Cranberry Bounce won a gold apple at the Oakland Educational Film and Video Festival and was on editor's choice in Booklist. "Bursting with fascinating facts and rewarding treats, this versatile, top-notch production is an excellent resource for both schools and libraries." From the shadows of a seasonal side dish, the bright crimson cranberry comes into the spotlight in this tantalizing video, packed full of captivating lore. Children on a cranberry farm guide viewers on a wintertime tour of their cranberry bog, follow the progress of the plants throughout the growing season, and join in the unique harvesting of the crop in the autumn. Supplementary commentary, bits of animation, and additional footage add scientific details and holiday traditions. Sweetening the sauce are the kids' infectious songs and corny jokes.